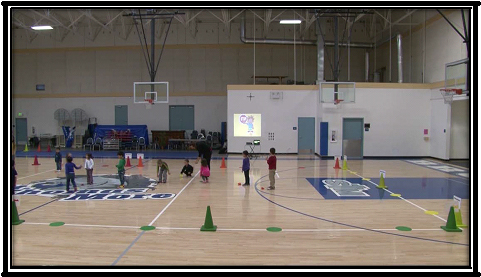 The focus of this lesson is to teach the children to start and stop moving on a specific signal while they are manipulating or using equipment. The children should stop instantly and put the equipment on the floor in their own space, when you call stop or freeze. This is especially important when you expect them to stop for safety reasons. Interchange use of both “stop” and “freeze” commands. Using these words every day, on the playground, in the classroom and even moving from one activity to the next will reinforce the concept and begin to develop the concept cross curricular. During this lesson, your children will also begin looking for open spaces to travel to and experimenting with a variety of ways to travel. Identify specific body parts verbally and by placing or balancing a bean bag on them. Review the safety rule: Play Safe. See if any of the children remember it from a previous lesson. 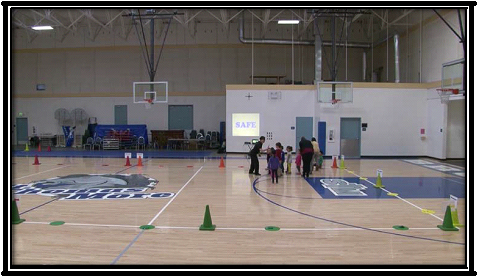 Today’s lesson teaches the children that following directions for moving and stopping will help them be safe. Encourage the children to find different ways to travel. After you have practiced traveling and stopping with a voice command, review Travel Stop with music. 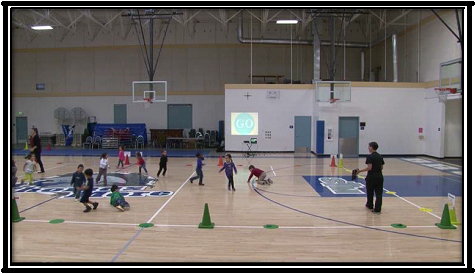 Consistently use the commands “Go” and “Stop” or “Freeze” in the classroom during the day. Encourage the children to identify the words on signs and other items. “Today you are going to play with the bean bag. When I say stop and you have the bean bag, drop the bean bag to the ground and freeze. When I say go, get a bean bag from a spot around our boundaries, find a safe place to toss and catch your bean bag until I say stop”. As your children toss and catch, watch to see that they are being safe staying away from each other. Encourage them by pointing out the children that are working in safe places and watching where they are going. Remind them as they play to look for open spaces to work in. Move away from everyone. Look for a space where no one else is. Every few seconds, call freeze and work on stopping and dropping the equipment. Once they are stopping consistently move onto balancing it, or holding the bean bag on different body parts. Start with head, move to shoulder and then back and stomach. Try traveling while they balance or hold the bean bag on those body parts. Each time you change body parts, call freeze to practice freezing and dropping the equipment. The children should stop moving and drop the bean bag whenever you say stop. Praise the children that have stopped immediately. This will reinforce that child’s behavior as well as demonstrate to the rest of the class what the expected behavior should look like. This will also make the child who is the good example feel really great! Remind the other children that they must stop and drop the bean bag as soon as the music stops. Encourage different ways to traveling besides walking and running by calling out different ways of traveling that you observe, or even some you don’t! Keep practicing until the class as a whole is moving throughout the space inside the boundaries, safely traveling to open spaces. When your children are traveling safely inside the boundaries and stopping when you give the signal, move onto the practice activities. Describe the types of traveling you see individual children using. Verbally describe or define the way the individual children are traveling. Some examples are; walk. crawl, jump, slide on their bottom, travel on hands and feet, skip, run, slide sideways, gallop, hop, Crab Walk, Slide on Stomach, etc. Challenge the children to choose a new way to travel each time the music begins. Practice Continue to practice travel and stopping while holding or balancing the bean bag using music! When the music plays, travel safely inside the boundaries. When the music stops, freeze and drop the bean bag, where ever you are and look for the teacher. If you use your own music (music without built in pauses), spend minimal time frozen or stopped, just enough to make sure everyone has stopped & Vary the amount of time traveling. Make sure to tell the children the new body part to balance or hold the bean bag on. Balancing and holding the bean bag on different body parts will naturally make most of them try different ways of traveling. Be sure to point them out! Use this time to begin assessing the children’s’ ability to identify specific body parts.